The 2017 Pier 33 Yacht Brokerage & Pre-Owned Boat Show will be held Saturday September 9 thru Sunday September 17 at Pier 33 in St. Joseph, Michigan. This is Pier 33's final event of the 2017 summer and will feature a broad selection of powerboats as the boating season winds down. Pier 33 will hold its annual Yacht Brokerage & Pre-Owned Boat Show, September 9 thru September 17, a two-weekend span offering boat sellers and shoppers nine days of boat buying opportunities. This event will focus on a wide variety of pre-owned power boats, in many sizes, styles and price ranges. The boat show event is free of charge and Pier 33 will provide complimentary refreshments both weekends. “This is also the time of year when we can really bring a good group of boats onto the market. Our inventory will be changing almost daily leading up to the event,” said Curran. Boat show hours will be: Saturdays (September 9 & 16) 10am-4pm, Sundays (September 10 & 17) Noon-4pm and weekdays in between 10am-5pm. The boat show will be located at Pier 33, 250 Anchors Way; St. Joseph, MI 49085. Additional information regarding the show can be found on-line at Pier 33’s website, pier33.com. 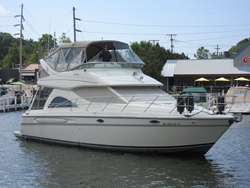 Pier 33 is a full service marina, yacht broker and boat dealership located in St. Joseph, Michigan. Marina facilities include docks, boat storage and boat repair, Launch and Command dry stack service and Hook n Go valet service. Pier 33 is a dealer for new boats from Chaparral and Robalo and serves boaters in a wide region including Michigan, Illinois and Indiana.